Poet's Notes: I like taking walks and running at night. The warm light of from lampposts and the cool wind make me feel like I'm in a different dimension, or so I like to imagine. There's this one house that keeps catching my eye. In my country, houses are heavily gated for safety. This house doesn't have a gate. And to top it off, it has a gigantic sliding window. 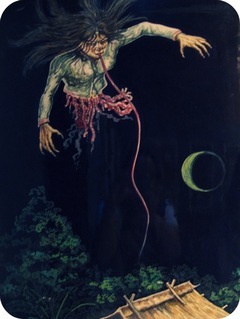 In Philippine mythology, there are fearsome demons like manananggal (pictured). They have long, thread-like tongues that can slither through the smallest openings on roofs and walls. Manananggal eat fetuses using their tongues, as if drinking from a straw. They fly about at night, often unseen. Recently there have been sightings. My imagination ran wild, thinking these things, and so, the poem.